Yep...the cast is back on. When they removed the first cast the x-ray showed that the break was healing well. Branson hobbled around without the cast for a few days and then refused to put any pressure on his injured foot and started crawling again. The doctor said there is no way to re-injure this type of break but that his leg probably needs more time in the cast for the added support. So for five more weeks we will be having sponge baths. 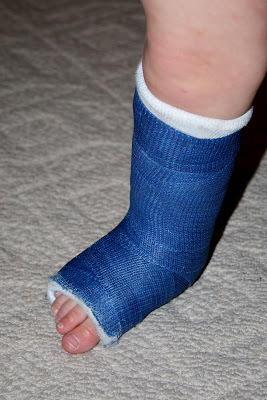 We went for the dark blue cast this time and he has been walking around on it better than ever. In fact...he has insisted on helping out more around the house. I have made the appointments and the rest of the family will be getting their casts put on next week. Oh man, I was eating a bowl of cereal when I was reading this and I about sprayed it over my computer screen when I read that last line. Amy, you are hilarious!! Aww, it look so sad and cute at the same time. I'm glad it's helping him though. I agree, your last comment had me laughing! Oh, poor little guy! What a trooper, vacuuming and helping out still. Goodness, I get a paper cut and I am out for the week!! Hey, I wanted to come over and officially thank you for your prayers for Timothy, he is back at school today and looking like his old self again...Thanks from the bottom of my heart Amy. That's too bad. Sorry! At least it's going to heal well and he'll be able to walk around. 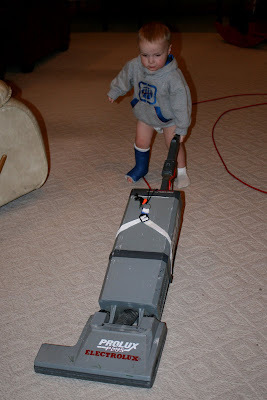 Very cute picture of the vacuuming! Love it! Amy! You are an absolute Genius!! Is it possible that you have actually found the solution to the age old problem of getting family members to help out around the house?!? WOW! If this actually works, I believe that you could be up for the next Nobel Peace Prize. This is much more impressive an achievement than anything our President has done! On a simpler note, you are just too funny! That's so funny. So that's what it takes to get a little help. bring them over - abe'll do it for free! my kids will be next in line. i'm so glad it's not another break. 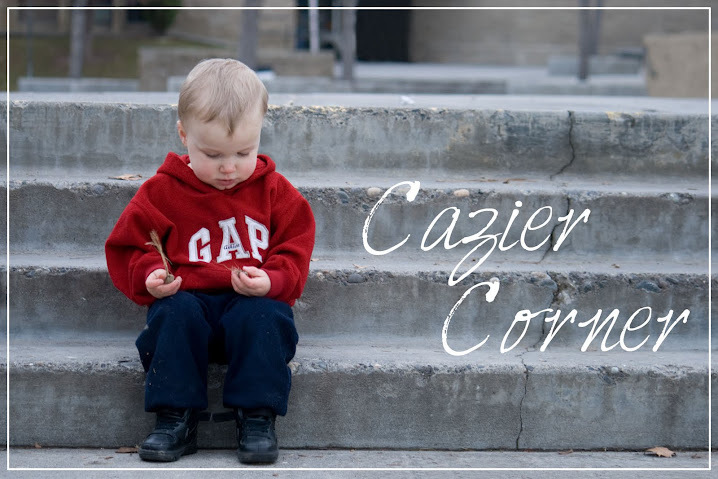 when i saw the picture i couldn't believe he broke another bone. glad he's such a good sport about it. Ha! That comment had me laughing too. I guess that's all we needed around here--just a cast for everyone! Seriously though, hope he finally heals up! Do you think he wants to come vacuum my house too? LOL! Let me know if that works for you--I'll be making the same appointments too! It matches his sweatshirt too. On a different note, what do you think about the Pasco school system? I know you're a bit biased, but which schools are good and which ones aren't? I'm looking for middle school and elementary. Amy, that last sentence made me laugh - and I needed to laugh, so THANKS!! !